Lord of the Flies. 1963, 1990. Lord of the Flies is a 1963 British drama film, based on William Golding's novel of the same name about 30 schoolboys who are marooned on an island where they become savages. It was directed and written by Peter Brook and produced by Lewis M. Allen. The film was in production for much of 1961, though the film did not premiere until 1963, and get released in the United Kingdom until 1964. Golding himself supported the film. When Kenneth Tynan was a script editor for Ealing Studios he commissioned a script of Lord of the Flies from Nigel Kneale, but Ealing Studios closed in 1959 before it could be produced. The novel was adapted into a movie for a second time in 1990; the 1963 film is generally considered more faithful to the novel than the 1990 adaptation. A group of young boys are stranded alone on an island. Left to fend for themselves, they must take on the responsibilities of adults, even if they are not ready to do so. Inevitably, two factions form: one group (lead by Ralph) want to build shelters and collect food, whereas Jack's group would rather have fun and HUNT; illustrating the difference between civilization and savagery. Cast: James Aubrey, Tom Chapin, Hugh Edwards, Roger Elwin, Tom Gaman, Roger Allan, David Brunjes, Peter Davy, Kent Fletcher, Nicholas Hammond, Christopher Harris, Alan Heaps. Download Lord of the Flies. 1963. Lord of the Flies. 1963. Lord of the Flies is a 1990 American survival drama film directed by Harry Hook and starring Balthazar Getty, Chris Furrh, Danuel Pipoly and James Badge Dale. 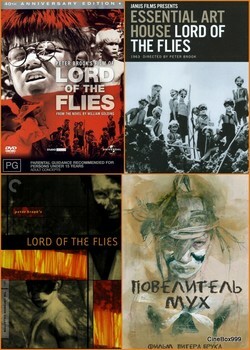 It was produced by Lewis M. Allen and written by Jay Presson Allen under the pseudonym "Sarah Schiff", based on the 1954 book Lord of the Flies, by William Golding. 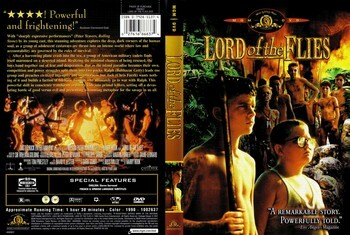 It is the second film adaptation of the book, after Lord of the Flies (1963). The film differs in many ways from both its predecessor film and the novel. Lord of the Flies centers on Ralph mainly, as the boys try to initiate a society after crash-landing on an uncharted island, but things go awry. The film was released on March 16, 1990 by Columbia Pictures, with film rights now belonging to Metro-Goldwyn-Mayer. Upon and since its release, the film has received mixed reviews, generally more negative than its 1963 counterpart. Most critics praise the film's scenery but center upon the film's deviations from the novel as a central flaw. However, the movie grossed $14 million and has acquired a cult following. After a plane crash in the ocean, a group of military students reach an island. Ralph organizes the boys, assigning responsibilities for each one. When the rebel Jack Merridew neglects the fire camp and they lose the chance to be seen by a helicopter, the group split under the leadership of Jack. While Ralph rationalizes the procedures, Jack returns to the primitivism, using the fear for the unknown (in a metaphor to the religion) to control the other boys, and hunting and chasing pigs, stealing the possession of Ralph's group and even killing people. Cast: Balthazar Getty, Chris Furrh, Danuel Pipoly, James Badge Dale, Andrew Taft, Edward Taft, Gary Rule, Terry Wells, Braden MacDonald, Angus Burgin, Martin Zentz, Brian Jacobs, Vincent Amabile. Download Lord of the Flies. 1990. Lord of the Flies. 1990.